It's Day 2 of the Summer Lovin Read-a-thon. Check out my sign-up, participation and challenge post for Day 1 here. Sign up for the Read-a-thon is open till July 6th so don't miss out, click on the event banner above for all the official stuff. I'm unfortunately not participating in todays challenge as I'm horrible with any type of photoshopping so I don't know how I can compete with some of the amazing alternative book covers I'm seeing. Tell us which books are on the top of your must-have summer reads list. They can be books you’ve read and recommend others to read, or books you want to read. How My Summer Went Up In Flames can be read FREE online till July 7th at PulseIt. Jennifer Salvato Doktorski is Summer Lovin Read-a-thon's Day 2 featured Authors so don't forget to check out her Interview with Love.Life.Read. I wanted to put Two-Way Street on my recommendation list too, but I only put the top 3 books I'll recommend. I actually just finished How My Summer Went Up in Flames today. Cute, fast read. And I love when anyone has Anna on their list. Anna is one of my all time favourite summer reads. It's so cute! I really like the sound of the other two as well. Thanks for letting me know about How My Summer -- I'll need to check that out. And Two way street has been on my list for a while now. How you liking Speak Easy? I cannot create redesign covers either! I need to add more contemporaries to my TBR, but I do really want to read Anna and the French Kiss. I need to find the time to read How My Summer Went Up In Flames online because that one sounds so good. I really want to read Two-Way Street as well, even though I don't remember any of its companion. And ANNA IS THE BEST. I want to read all three of those! They look really good! Good luck with your goals! Oooh! 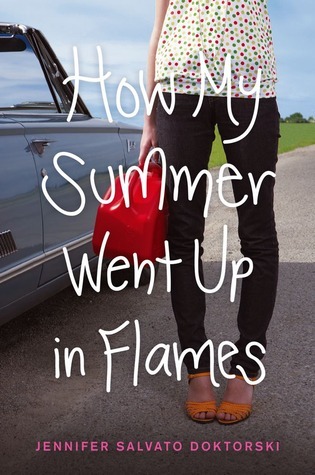 I didn't realize that I could read How My Summer Went Up in Flames on PulseIt! Now I just might have to bump that up to the top of my list. Loved Anna and the French Kiss!! Thanks for stopping by my participation post! I have the first two in my TBR pile. I hear How My Summer...is really good! And I really liked Anna and the French Kiss! Thanks for stopping by my blog! I love your header art! So unique! I love Anna and the French Kiss! It's a perfect summer read! I've apparently read Two-Way Street according to Goodreads, but I seriously can't remember anything about it. Awkward haha. I love Stephanie Perkins! Thank you for the tip on How My Summer Went Up In Flames. Thank you for stopping by my post. I am looking forward to your updates as well. Best of luck with your goals. sounds like a great list. I enjoyed reading the reviews and background info on your selections. Thanks for stopping by my blog. I see Anna and the French Kiss everywhere. I guess I need to check it out sometime! Great list! Looks like great summer reads. I will check out the How my summer went up in flames! Thanks for stopping by my blog! Happy reading! It's so cute! I haven't read the other two book though, but I really want to! You know, I maybe the last person left that has not read Anna and the French Kiss. I should probably correct that! I LOVE Anna and the French Kiss! Two-Way Street is cute too (I just finished reading the companion a few days ago, and I think I liked it even more) and I really want to read How My Summer Went Up in Flames. Great choices, Angelica! I thought I had already posted a comment here, but either I forgot to hit Publish or the comment is still in moderation (sorry for the double-post if that's the case!). I loved Anna and the French Kiss!! I didn't realize that How My Summer Went Up in Flames was available on PulseIt - I'll have to push that up on my reading list so I can read it this week! Thanks for stopping by my Day 2 Challenge post!